Before and after surgery. 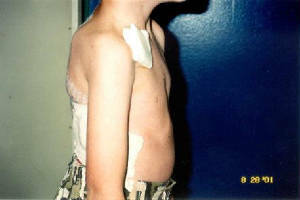 On the right, you can see how much fuller and straighter Braydon's back and hips and shoulders are after his Titanium Rib (VEPTR) placement surgery (August 15, 2001). 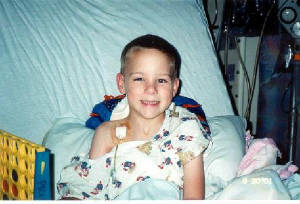 Click here to read about Braydon's Titanium Rib experience. Click on any photo below for a full image view. The morning of surgery... the anxiety is pretty hard to deal with. Day 2. Still sedated and resting, beginning to breathe more often on his own. 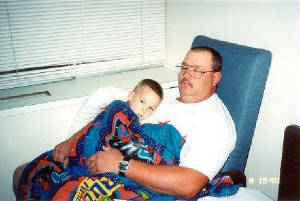 Aug. 20 - anxiously waiting to be released from PICU. Braydon felt well enough to sit and play Connect Four. Great PT for his right arm. Day 12 (Aug. 26) Braydon is doing GREAT! He's able to sit and stand with little assistance. Aug 27. 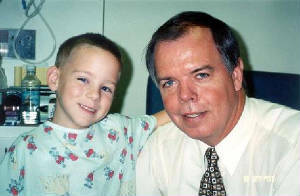 Braydon with Dr. Campbell. Sept. 8. 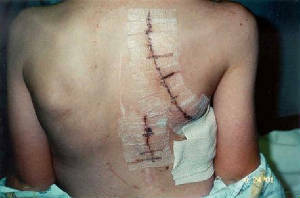 Braydon's incisions 3-1/2 weeks post-op. 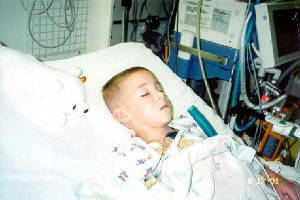 The thoracotomy incision is overwhelming, but very necessary when you think about the whole procedure and how well Braydon is doing now! The chest tube holes healed nicely. 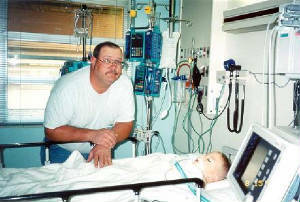 Our first glimpse of Braydon after surgery, in PICU. 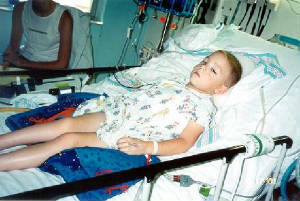 Quite overwhelming; ventilator, various medications running through multiple IV lines, central line, ng-tube, etc. 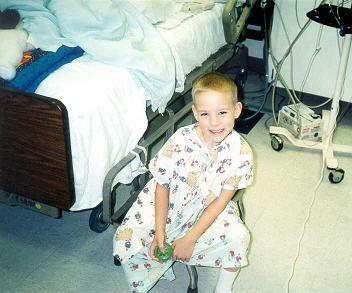 Day 3 (Aug. 17) Braydon is extubated and already in a reclining position. Aug. 19. Braydon sits up for the first time! And even smiles - what a sport. We are so proud of him. Day 10 (Aug. 24). Our first view of the incisions. If you look closely at the skin on the left side of his back, you can see tiny scabs. 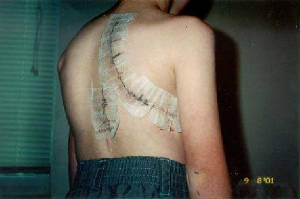 Those are from the staples used to open the skin to access the ribcage for cutting apart the ribs (thoracoplasty?) and placement of the VEPTR devices. Both chest tubes already been removed. Day 12 still. 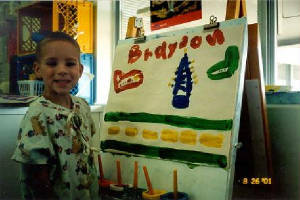 Painting a picture (airplanes, control tower and runway) is great therapy for his arm. He's gaining strength and stamina. Aug. 28. 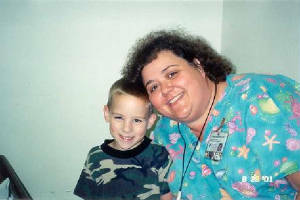 Braydon with Lori (RN, project coordinator). 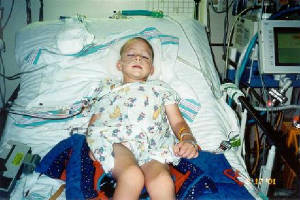 Another view of ventilator, central line and multiple tubes for various medications to keep him sedated. Almost a smile! 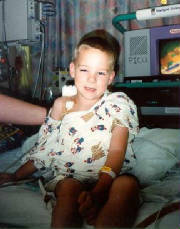 Still has ng-tube, foley cath, all IV lines and central lines, but no longer sedated. 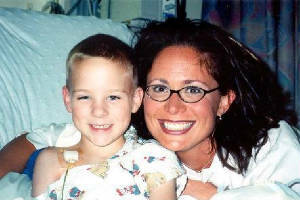 Braydon with Dr. Johnson (Aug. 20). 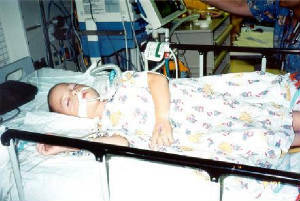 She was the PICU (chief?) resident who took very good care of Braydon. She diagnosed Braydon's Horner's Syndrome (his droopy right eye and different dilations in the pupils). 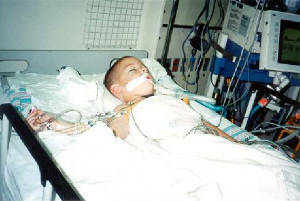 The Horner's was caused because they placed the chest tube drain(s) too high, temporarily damaging the autonomic nerves to his right eye. 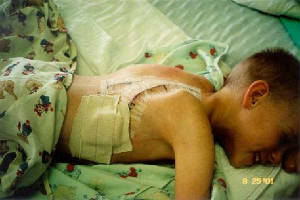 Day 11 (Aug. 25) Another view of the incisions and where the chest tube placement was. Day 14 (Aug. 28) Going home! Well, leaving the hospital to go to the hotel. See how much fuller his chest is??? Aug. 27. 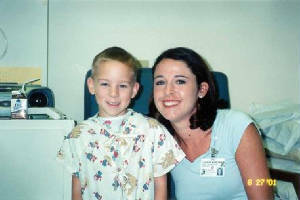 Braydon with Lindsey, Child Life Specialist.